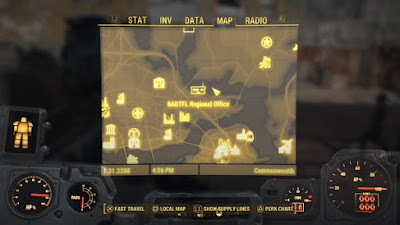 - BADTFL Regional Office is located on the fringes of the centre of the Commonwealth, northeast of Diamond City. You’re most likely to come across it on your own while performing dead drops for the Railroad, though it’s close enough to a riverside bridge that you may stumble on it while exploring from the northeast as well. - The outside of the Regional Office is guarded by several Raiders. Not a huge contingent, but enough to keep you on your toes. You can approach them stealthily from several angles to get the upper hand, or just find cover and start shooting. There’s a decent chance that they will get into a scrap with the Brotherhood of Steel , Super Mutants, or a Deathclaw as you’re entering the area, so you may be for in more or less of a scrap than anticipated. - Before entering, look across the street from BADTFL. There's a row of houses, and one of the eastern homes has a generator on top. If you go between this row of houses and the next you can find stairs leading to the roof. (Watch out for Mongrels along the way.) There's a Fusion Core plugged into this generator. - You’ll hear Turret fire and yelling when you first enter BADTFL, but neither is of immediate concern. Of more concern is the pack of Raiders waiting in the adjacent rooms of BADTFL. If you go straight ahead from the entrance you’ll find a larger pack waiting, including a Turret; if you take a right first you’ll find a smaller number in a side room. I highly recommend going right if you decide on a stealthy course of action, as the Raiders will come at you in numbers should you make noise, and through this right room you can find a Protectron which can act as a handy distraction. You’ll need Expert-level hacking to activate it, however. - The Raiders in here move through the rooms quite a bit, so it’s difficult to provide a general strategy. The best thing I can suggest is to stay out of the open rooms and try to engage the Raiders in doorways in order to limit their numbers. You have many hiding places to fall back on, and you may need them unless you’re running around in Power Armor. Be aware that the Raiders can flank you from multiple angles. There’s an Armor Workbench in the right room from the entrance, in case you have a desperate need to craft stuff. There’s a Novice locked door near the room with the Turret if you go north from the entrance. Inside is an Advanced locked safe. Near this door is a locked cage; pop it open to find more goodies, including a Fat Man, a Mini Nuke, a Stealth Boy, a few Stimpaks, an Expert locked safe, and the We Are Done Holotape. In the northeast corner you’ll find a containment cell, and beside them several filing cabinets. Eddie Winters Holotape 0 is sitting on the smallest cabinet. Unlock the cell and you can find several useful goodies in the corner. You’ll find a Weapons Workbench in the western room. There are two terminals you can access here. The first contains a variety of case filesThe second is in a blocked-in corner cubicle that you can only reach by hopping onto a desk and then over the wall; it deactivates the Turret in the main hall, and can open an Expert locked wall safe near the terminal. The wall safe contains the Evidence Locker Key, which as far as I can tell gets you into the locked cage with the Fat Man. Beside this terminal is a copy of Guns and Bullets magazine. That’ll bring your trip here to a close, more or less.